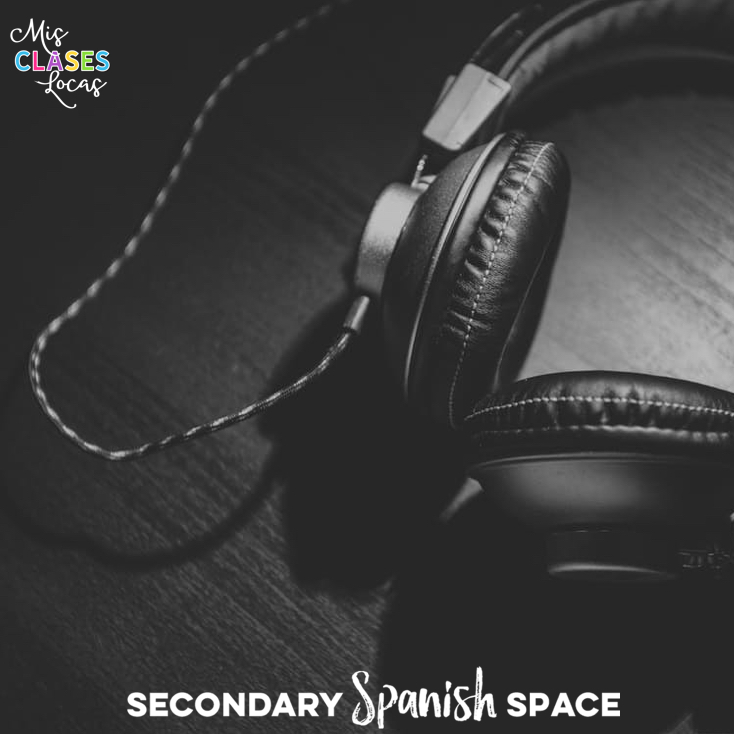 Welcome to the Secondary Spanish Space! We are a group of Spanish teachers who have come together to share ideas and resources. I am Allison from Mis Clases Locas and I am glad you stopped by to visit. 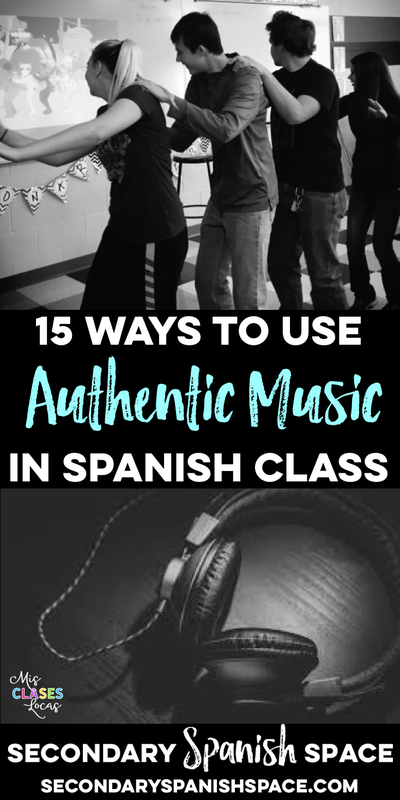 Today I am sharing 15 ways I incorporate authentic music in my Spanish classes. Make sure to incorporate music with a set day devoted to it. In my classes, we typically start class on Wednesday with music. I do this by having a projected slide with artist, title and task, with an embedded music video playing as all classes enter. We watch the video, discuss it a little and move on with our day. This could also be used to break up class as well. Some days we spend the entire class period doing talks with the song, but usually it is just a para empezar class starter. Another hit routine using music is baile viernes, or dance Friday. At the start of class a dance video in Spanish is projected on the screen. Students run to class to dance, including some who are not even in Spanish class who want to join in on the fun. 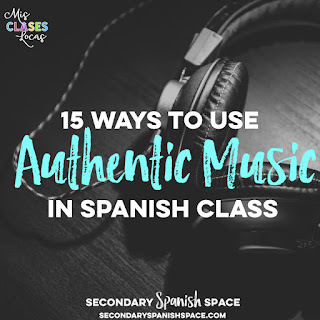 These are usually easy Zumba or Just Dance in Spanish that play during passing time and once again at the start of class. In my classes it has been a relationship builder and way to promote a positive classroom culture. Do I force everyone to dance? No. Just like in real life, not everyone likes to dance, but they usually still love watching their classmates and being a part of the fun. 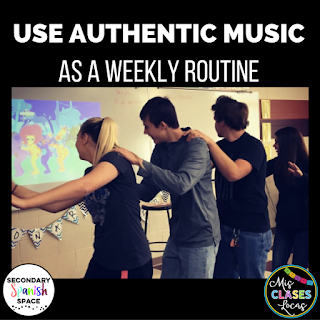 Instead of starting class with music, another great way to incorporate it is through brain breaks. To help your students relax and recharge for a new episode of learning, put on a song to listen to, dance to or sing along to. Do you ever have five to ten minutes left at the end of class that you want to fill with something worthwhile? 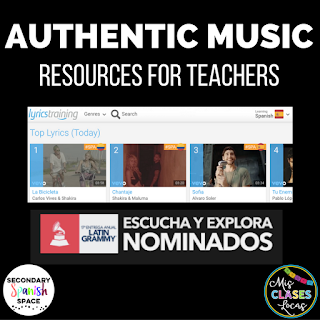 You can always show an appropriate music video to expose students to new music, or let them request a class favorite as a reward. Instead of just starting one or two days a week with music, why not every day? Kara Jacobs has a new song and artist each week, and starts each day with activities related to them. This includes a slide show learning about the artist and where they are from, listening to the song with activities, singing along, and more. 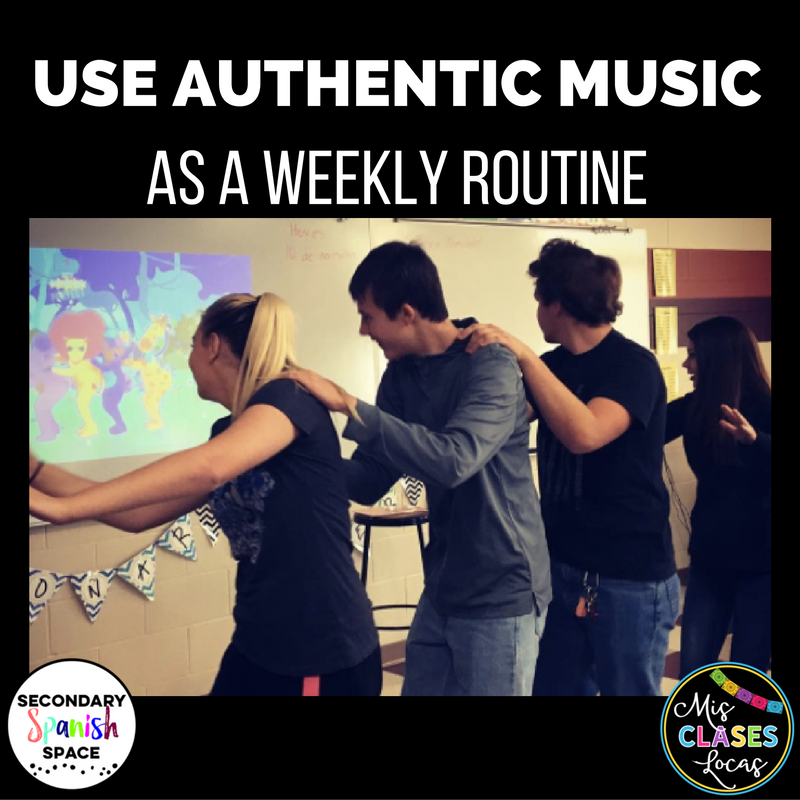 It is a great way to incorporate a variety of authentic resources and culture daily, while engaging students in something they are interested in, music! The past two years during March Madness I have put together a Spanish music bracket. Students vote for songs to be included, which are then put on a bulletin board, and students vote for songs to advance. We usually vote for one match up per day, but this could also be done as a mini unit for a couple of days. This is a great break in the routine for any time of year. Instead of just learning the countries and capitals that speak Spanish, dig deeper. Use one song from each country to help give more meaning as you work on the geography of the Spanish speaking world. This could be expanded to talk about artists from each country or popular genres of music. Sr. Wooly has amazing videos that provide comprehensible input through music. I have Sr. Wooly Pro, so we have access to all of his songs, and students can work on "nuggets" related to specific songs. Assigning nuggets is an easy, no prep substitute plan in a pinch. These songs can also be expanded into whole mini units. My exploratory junior high class just did a unit on the song "Puedo ir al baño." You will not be able to get these catchy songs out of your head! Use the Movie talk technique with a music video as a short film. This can be done by muting the audio, and describing what is happening using comprehensible Spanish while pausing many times. You will want to warn students in advance that you will be pausing, so they are prepared for the interruptions. In Spanish, you can then discuss student predictions to what they will see and hear during the song. Finally, watch the music video with sound, and see if the class predictions were true. Have students pick their favorite songs to learn to lip-sync or actually sing to. These could be showcased in a class performance, a music video, or even better at a school wide event that would help spread the love of music in Spanish. You could also do a lip-sync battle in Spanish, with students going back and forth competing with prepared lip sync songs. This is a resource for finding new music by genre. Students can explore the site, see past winner, and maybe even vote for their favorite from each category in your own mock award show. 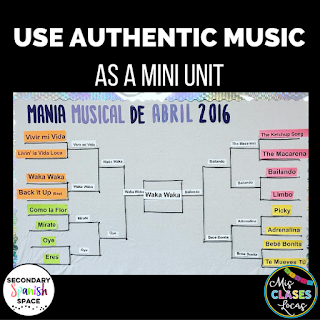 If you have 1:1 devices, students can work through filling in the lyrics of their favorite songs in Spanish. There are multiple levels for differentiation and they are always adding new music. It is a favorite of students for their choice homework options. This is a great way for students to explore the different genres with options to read and listen about genres, as well as watch mini interviews with famous artists. Use the current hits as an inspiration for your weekly música miércoles and to discover new songs and artists. I have a ton of Pandora stations based around class favorite songs or artists in Spanish. Students like to have it playing softly in the background during work time, speaking assessments, or during passing time. 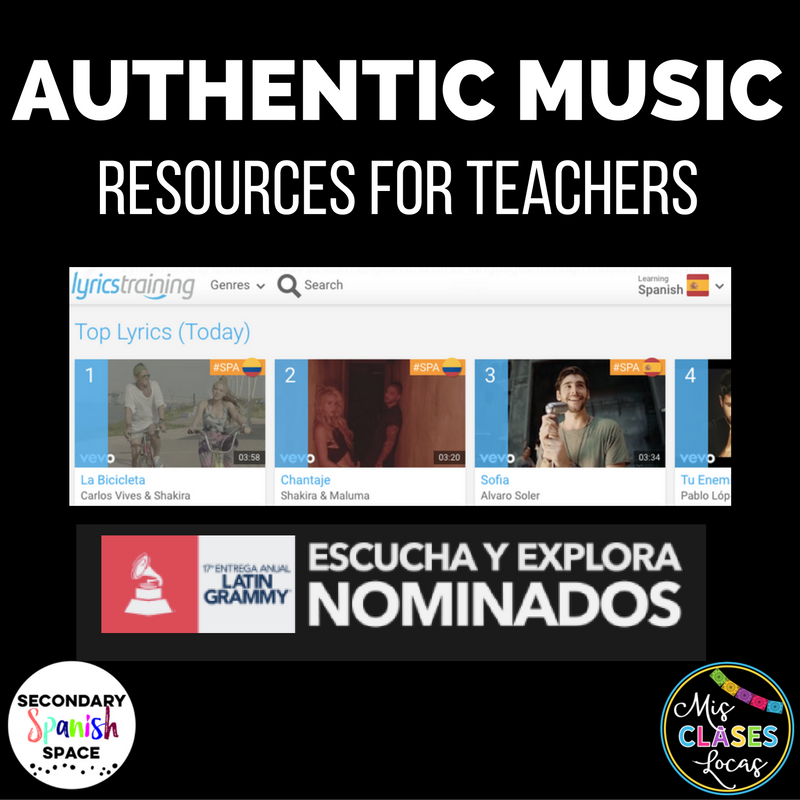 Pandora or other music streaming services are another way to discover new songs and artists based on those that you and your students already like. 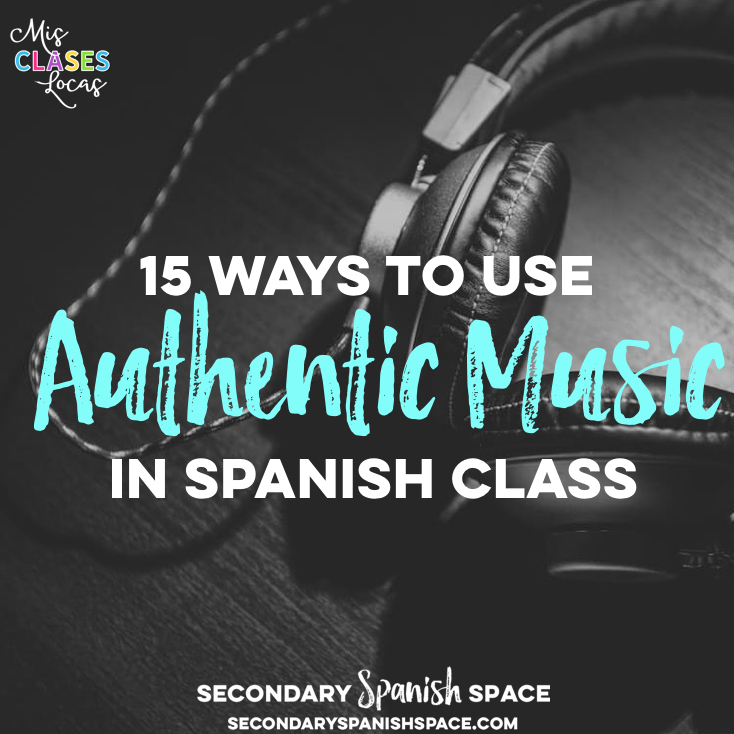 How do you incorporate music in your Spanish class? Please share in the comments! Love it! I'm going to share it on my Facebook. Gracias Catharyn! I am glad you found it helpful! Great post! I do a unit with my 6th graders that teaches them geography, names, ages, birthdays, and how say I like/don't like/don't care/I hate it using music! They love it and ask for the songs again. I also pick some I know they will not like so they can practice with those structures. I also used you Hispano al Día as bell ringer activity and my students loved it! This year I begin every class with a Video del Día. Students keep a video journal and each day they write down that day's date in Spanish and the Title, Artist, and Country of the song, then they have to write at least five sentences relating to the video. I often instruct them to use the specific grammar points that we have learned in class, such as present progressive, preterite, etc. After the video I ask for volunteers or draw names of a few students randomly to read one of their sentences. Hi have the option that school will buy a subscription for spanish 1 And 2 to use in the classroom /homework, any suggestions please? Love it! I'm going to share it on my INSTAGRAM.